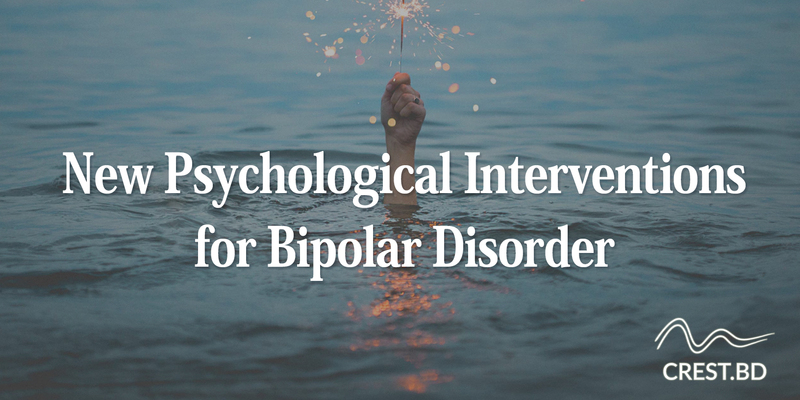 Over the past decade, psychosocial interventions have been shown to be effective adjuncts to pharmacotherapy for bipolar disorder (BD). However, effect sizes are not large, mechanisms are poorly understood, and more research is urgently required to improve outcomes for people with BD. Our international group has sought to innovate in this space, building on theory and research in two broad areas: quality of life (QoL) as an outcome measure, and the potential importance of ‘staging’ psychosocial interventions for BD. These streams of research share an emphasis on recovery, which is commonly defined as, “a deeply personal, unique process of changing one’s attitudes, values, feelings, goals, skills and/or roles . . . a way of living a satisfying, hopeful and contributing life even with the limitations caused by illness” [1, p.15]. Initially driven by the mental health consumer movement, the recovery perspective has been adopted in mental health policies and guidelines worldwide, and has rapidly become the expressed goal of treatment for persons with persistent mental disorders . Indeed, recovery has so rapidly become instantiated in mental health guidelines throughout the western world that practice has arguably outpaced research . Personal recovery (contrasted with clinical and functional recovery) is commonly defined as the process of individual psychological adaptation to a disorder, contrasted with the reduction of psychiatric symptoms, relapse prevention or addressing functional difficulties . There is a clear focus on social justice in the recovery movement, and its implications for stigma, social inclusion and traditional health power structures are frequently discussed [5, 6]. Commonly recognised elements of recovery are connectedness, hope and optimism, identity, meaning in life and empowerment (giving the acronym CHIME, , and there are consumer calls for the aims of psychosocial interventions to be more congruent with these humanistic values . Growing interest in recovery-congruent aims has, in turn, encouraged focus on outcome measures that capture broader subjective experiences of the individual. To date, QoL has received the most research attention . The World Health Organization defines QoL as: “an individual’s perception of their position in life in the context of the culture and value systems in which they live and in relation to their goals, expectations, standards and concerns” . Importantly, QoL variables are not merely the inverse of symptom variables. That is, some patients maintain role functioning despite severe symptoms, while others report significant functional and QoL decrements in the context of relatively few symptoms. Indeed, QoL measures have only small to moderate negative correlations with symptom measures [e.g., 11]. Trajectories of symptom and QoL outcomes also diverge over time, whether measured naturalistically  or in response to treatment . Finally, patients see QoL and other foci that are broader than symptoms as core treatment targets . The recovery perspective on mental health elevates QoL measurement, consistent with its prioritising of personal agency, context, meaning-making and lived experience [e.g., 5]. QoL outcome measures emphasise individual experience across important life domains in the context of an individual’s culture and values system . In sum, there is growing consensus that symptom measures alone do not capture clients’ or therapists’ aims and clinical outcome measures in BD should be augmented. Future investigations of recovery-focussed interventions may choose to prioritise measures of subjective QoL if these are in fact the primary aims of psychosocial treatment. Stage-sensitive treatment approaches are common outside mental health. In cardiac health, for example, the ischaemic heart disease model contrasts at-risk individuals, those whose illness is showing signs of progression (symptoms of hypertension, metabolic syndrome etc.) and those with overt cardiac disease [e.g., angina, 15]. The staging approach is less well developed in psychiatry than other areas of medicine. In BD, the staging approach has overlap with the notion of neuroprogression, around which many empirical questions remain: A recent review concludes that neuroprogression is not a general rule in BD, but that a proportion of patients show this unfavourable course . To avoid unwarranted demoralisation, then, it is important to stress to clients and clinicians that progression in BD is not universal and can potentially be reversed with optimal treatment and support. Staging models generate a number of testable predictions. First, earlier stages tend to have a better treatment response, a more favourable risk-benefit ratio and respond to more benign and potentially transdiagnostic therapeutic interventions. Second, if staging is aetiologically meaningful, earlier intervention should impact the course of the disorder. Third, to the extent that stage progression is underpinned by neurobiological changes, biomarkers should be discernible. Finally, and perhaps most critically, treatments that are tailored to disorder stage should be more effective than solely diagnosis-driven interventions due to their more personalised characterisation of the disorder [17, 18]. The notion of BD staging is consistent with the recovery approach in prioritising interactions between person and disorder. In contrast to a narrow diagnosis-driven approach, stage tailoring aims to guide interventions according to the experiences and needs common to individuals at particular stages of their disorder. For example, individuals in the early stages of BD appear more likely to benefit from psychoeducation and traditional CBT , while it has been suggested that acceptance-based interventions might be more beneficial in later stages . Indeed, there is some post hoc evidence that people in the later stages of BD may be harmed by existing psychosocial interventions . One mechanism of this apparent iatrogenic effect might be people’s unproductive self-appraisals when relapse prevention efforts prove ineffective. One example of innovation in this space is the ORBIT project, an ongoing clinical trial comparing two brief online self-management interventions aimed at improving QoL amongst people who have had at least 10 episodes of BD. The programs (accessible via personal computer, tablet and mobile phone) are brief (4 modules delivered over 5weeks), self-paced, interactive and tailored to late stage BD. They incorporate a range of multi-media components to maximise engagement and motivation: videos of consumers with lived experience and clinicians, audio files for practicing learned concepts, interactive exercises, quizzes, static images and hyperlinks to PDF content for further learning opportunities. Guided support is offered via once-weekly asynchronous messages (from trained coaches); peer support is offered via moderated forums and the ability for users to connect privately with each other via a secure-messaging system embedded in the program. The programs are intended to be highly interactive: users are encouraged to track and monitor well-being via an embedded tracking tool, complete interactive exercises and reflect on their participation as they complete each module, contribute to forums, connect with other users (fostering social support) and message their coach for assistance. Engagement and adherence is encouraged via coach messages, seeded forum posts and cognitive behavioural principles to facilitate practice of skills in everyday life. Anthony, W.A., Recovery from mental illness: The guiding vision of the mental health service system in the 1990s. Psychosocial Rehabilitation Journal, 1993. 16(4): p. 11-23. Song, L.-Y. and S.-T. Hsu, The development of the stages of recovery scale for persons with persistent mental illness. Research on Social Work Practice, 2011. 21(5): p. 572-581. Tse, S., et al., Exploring the recovery concept in bipolar disorder: A decision tree analysis of psychosocial correlates of recovery stages. Bipolar Disorders, 2014. 16(4): p. 366-377. Cavelti, M., et al., Assessing recovery from schizophrenia as an individual process. A review of self-report instruments. Eur Psychiatry, 2012. 27(1): p. 19-32. Commonwealth of Australia, A national framework for recovery-oriented mental health services: policy and theory. 2013. Manove, E., L.M. Price, and B. Levy, Psychosocial Functioning in Bipolar Disorder from a Social Justice Perspective., in Bipolar disorder: a portrait of a complex mood disorder, J. Barnhill, Editor. 2012, InTech. p. 193-220. Leamy, M., et al., Conceptual framework for personal recovery in mental health: systematic review and narrative synthesis. Br J Psychiatry, 2011. 199(6): p. 445-52. Jones, S., et al., The bipolar recovery questionnaire: psychometric properties of a quantitative measure of recovery experiences in bipolar disorder. Journal of Affective Disorders, 2013. 147(1-3): p. 34-43. Murray, G. and E.E. Michalak, The quality of life construct in bipolar disorder research and practice: past, present, and possible futures. Bipolar Disorders, 2012. 14(8): p. 793-6. The WHOQOL Group, The World Health Organization Quality of Life assessment (WHOQOL): position paper from the World Health Organization. Social Science and Medicine, 1995. 41(10): p. 1403-1409. Michalak, E.E. and G. Murray, Development of the QoL.BD: A disorder-specific scale to assess quality of life in bipolar disorder. Bipolar Disorders, 2010. 12(7): p. 727-740. Morton, E., et al., The Naturalistic Trajectory of Quality of Life in Bipolar Disorder., in 17th Annual Conference of the International Society for Bipolar Disorders (ISBD 2015). 2015: Toronto, Canada. Ishak, W.W., et al., Quality of life: The ultimate outcome measure of interventions in major depressive disorder. Harvard Review of Psychiatry, 2011. 19(5): p. 229-239. Sajatovic, M., et al., Medication treatment perceptions, concerns and expectations among depressed individuals with Type I Bipolar Disorder. J Affect Disord, 2009. 115(3): p. 360-6. Hickie, I.B., J. Scott, and P.D. McGorry, Clinical staging for mental disorders: A new development in diagnostic practice in mental health: Matching the timing and intensity of interventions to the specific needs of patients. Medical Journal of Australia, 2013. 198(9): p. 461-462. Passos, I.C., et al., Areas of controversy in neuroprogression in bipolar disorder. Acta Psychiatrica Scandinavica, 2016. Berk, M., K.T. Hallam, and P.D. McGorry, The potential utility of a staging model as a course specifier: A bipolar disorder perspective. Journal of Affective Disorders, 2007. 100(1-3): p. 279-281. Scott, J., et al., Clinical staging in psychiatry: A cross-cutting model of diagnosis with heuristic and practical value. British Journal of Psychiatry, 2013. 202(4): p. 243-245. Berk, M., et al., Stage managing bipolar disorder. Bipolar Disord, 2013. Scott, J., et al., Cognitive-behavioural therapy for severe and recurrent bipolar disorders: Randomised controlled trial. British Journal of Psychiatry, 2006. 188(APR. ): p. 313-320.